Pennsylvania and North Carolina auto body shops’ class-action RICO case filed against the top auto insurers in the country has been denied, though the Florida judge in question will allow all the allegations to be re-argued. 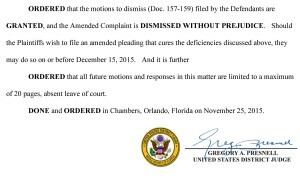 Setting a Dec. 15 deadline to amend Crawford’s Auto Center Inc. and K&M Collision LLC et al v. State Farm Mutual Automobile Insurance et al Middle District of Florida Judge Gregory Presnell dismissed it without prejudice Wednesday. Though the case wasn’t among the multistate fleet of collision repairer lawsuits following the lead of Florida’s failed A&E v. 21st Century case, it too was placed before Presnell given similarities in content. The cases all allege steering and collective actions by insurers to drive down shop labor rates. In Crawford’s v. State Farm, the collision repairers accused the insurers of acting collectively in violation of the Racketeer Influenced and Corrupt Organization Act rather than the Sherman Antitrust Act cited in most of the other cases. They also allege fraud and unjust enrichment. Presnell wrote Wednesday that the lawsuit was far too broad as written now, calling the 157-page document “likely 100 pages longer than it ought to be.” He’s criticized the A&E family of cases on similar vagueness grounds. Noting that this consideration was “far from the only serious flaw in the Amended Complaint,” he offered some other grounds — which could help by providing a roadmap for the Crawford attorneys. The court does offer one ray of sunshine by calling a GEICO argument “premature” and not necessarily supported by the law. Essentially, GEICO argued that it was its customers fault, not its own, that shops were being hurt. “Specifically, GEICO argues that it contracts with its insureds (rather than repair shops) to pay for repairs, while it is the insureds that contract with the repair shops (and, presumably, underpay them),” Presnell wrote. “Thus, any injuries would have been inflicted on the Plaintiffs by GEICO’s insureds, not GEICO. However, this argument relies on facts outside the pleadings and is therefore premature. As another counterpoint to GEICO — and to offer our own little ray of sunshine — we offer this exchange from a lawsuit in Vermont. Learn more about that case, which is unrelated to any of the ones being heard by Presnell, from this April 2015 New England Automotive Report coverage. Presnell’s ruling seems either overly dismissive or to not comprehend the shops’ argument. “The Plaintiffs are arguing (1) that what they feared losing was not money but the ability to perform repairs on insured vehicles, and (2) that receiving compensation paid by insurance companies was not the benefit they received but rather the burden they shouldered to be able to continue performing repairs on insured vehicles,” he also wrote. As to Point (1), Presnell seems not to understand that the ability to perform repairs on insured vehicles is what brings money to a shop. If an insurer forces a customer to pay the difference, causing a policyholder who picked that shop (as is their right) to take their business elsewhere, or an insurer steers customers away from a shop which doesn’t agree to an artificial prevailing rate, that costs business, and therefore money. As for 2, the loss of the difference in what the shops say they should have been paid and what they got would be the burden, not the work itself. But then Presnell suddenly seems to understand the argument. “In actuality, the Plaintiffs admit throughout the Amended Complaint that they accepted what they believed to be suppressed compensation because if they refused to work that cheaply, some other repair shop would get the work,” he writes. Unfortunately, the law isn’t on the shops’ side, according to the judge: A potential benefit doesn’t count as a RICO extortion fear, he writes. “Under the Hobbs Act, the victim must fear an actual loss, not merely the loss of a potential benefit,” Presnell wrote. That could be a tougher nut to crack. Also, the Hobbs Act requires the acquisition of property, according to Presnell. The shops’ argument that services count isn’t backed up by precedent within their lawsuit. A better citation might help here. Just as it seemed as though Presnell understood the argument, he seems to forget it again with a gross oversimplification. “Give me a discount or your customers will leave you alone,” is what the insurers – who are middlemen in 75-90 percent of all auto repairs — are really saying, according to the shops. And then, we have Presnell’s ludicrous conflation of an insurer to the actual customer. “(T)here is nothing wrongful about a buyer threatening to take its business elsewhere unless the seller agrees to the buyer’s price,” he writes in one part of the dismissal. Later, he seems to do the same, comparing an insurer’s participation in 70 percent of the market to the market itself. Essentially, Presnell is saying the customer is the middleman, and the insurer is the buyer. That’s like calling the guy holding your money in escrow for a transaction the buyer. Wonder if he feels the insurer is the buyer when he goes to the doctor?